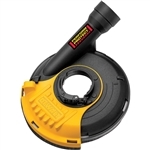 Dewalt 5" Dust Shroud DWE46150 for grinder dust collection. Designed to be used with the Dustless Wet Dry/Vacuum, the D1850 DustBuddie® Dust Shroud captures up to 99% of the dust created by a hand grinder, before it escapes into the air. 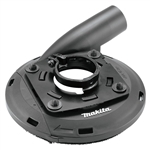 Makita’s new grinder dust shroud is designed to fit Makita 4-1/2" - 5" grinders. The MK-IXL concrete grinder shroud has been engineered to control dust during concrete grinding operations. The shroud’s snail shape design utilizes the air velocity created by the rotating grinding wheel to efficiently channel dust particles away from the work surface and into the vacuum port. Dust Containment System for circular saws, captures up to 95% of the dust created, before it escapes into the air.